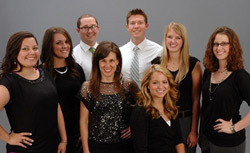 Although Holmberg Wellness Group just opened its doors in the summer of 2010, we have been providing chiropractic care to the Wichita area for nearly a decade. We are on a mission to educate and motivate people in our community to natural healing and wellness promoting ideas. Dr. Holmberg has a “patient first” mentality. We strive to meet every health need of the patient in a very timely manner. Delivering exceptional service and high quality care in a family oriented environment is our everyday goal. We desire to find the cause of the patient’s health problems and eliminate it, thereby getting rid of the problem for good. We do more than just treat the symptom and patch up the problem. Regardless of your health goals, please understand that we see ourselves as mere servants. You’re the boss! It’s your body, your health and your future. Our job is to offer you the finest chiropractic care possible in Wichita, make appropriate recommendations and work together to achieve your goals. Take the first step towards relief by calling our Wichita practice today and making an appointment to discuss your health goals.